The multi-dimensioned experience of human consciousness can be better understood, when it is perceived to be the output of an entity with astronomically large memories. Those combinatorial memories can store millions of years of evolutionary experiences and those of a lifetime of human activities. Intuition enables real time contextual application of this knowledge. Combinatorial patterns of signals represent outputs of innumerable intelligences in the system. Libet's experiments showed that consciousness merely reflects a delayed knowledge of system processes. Homeostasis experiments have revealed a hierarchy of intelligences in the system. The final reports of the system reach the claustrum, which integrates the information into a single whole picture. Electrical stimulation of the claustrum caused a patient to lose consciousness. The claustrum merely rationalizes the gist of the received information. The concept of "Emergence" may be the only explanation available to us of the subjective quality of consciousness. Consciousness depends on the intuitive manipulation of an astronomically large mass of data. Known mechanisms used by nerve cells can store and transmit galactic volumes of data. This mechanism was recently reported by science. It was discovered (Nobel Prize 2004) that your ability to identify a single smell from millions of smells came from the faculty of arrays of nerve cells to remember combinatorial patterns. Combinatorial arrays manipulate data in computers. On/Off switches in a 64 bit parallel port in a computer can transmit billions of separately identifiable pieces of information. Similarly, an array of 100 nerve cells can theoretically differentiate between over 1, 000, 000, 000, 000, 000, 000, 000, 000, 000, 000, 000, 000, 000, 000, 000, 000, 000, 000, 000, 000, 000, 000, 000, 000, 000, 000, 000, 000, 000, 000, 000, 000, 000, 000, 000, 000, 000, 000, 000, 000, 000, 000, 000, 000, 000, 000, 000, 000, 000, 000, 000, 000 unique possible combinations! Arrays of “on/off” combinatorial codes stored in millions of nerve cells can retrieve and represent a galactic mass of information. It is this mechanism, which enables the miraculous breadth and depth of conscious awareness. The power of the mind comes from its ability to identify a galactic number of combinations. Each combination can represent a single pattern recognition symbol in a nerve cell array. Assemblies of such symbols in a bundle of nerve cells can represent all the sentences in all the books you have ever read. They can represent all the emotional signals you have ever experienced; all the objects you know; all the semantic expressions you have ever used; all the images, smells, tastes and sounds you have ever heard; all the remembered muscular movements while riding a bike; all the pain points you have experienced. Intuition is an algorithm, which enables the system to recognize the context of such patterns at lightning speeds. Consciousness mirrors the outcome of such neural activities. Intuition links the galactic dimensions of data into a single whole. It identifies the single pattern which meets the context of all the experienced signal patterns. Differentiating between microscopic variations, intuition identifies “charm” as meeting a particular context better than “dignity.” The final outcome of processing signals all over the body appear on the consciousness dashboard in a nerve cell array related to the claustrum. Science has observed that this processing takes place before the final data reaches conscious awareness. Consciousness views the outputs of the most powerful intelligence in the known universe. Pattern recognition provides the basis for this intelligence. The olfactory system was discovered to recognize smells by recognizing the firing combinations of odor receptors. The assembly of nerve cells in the olfactory region resemble a banyan tree, whose branches are dendrites, and roots, axons. The dendrites of this system receive neural signals from odor receptors, while axons dispatch recognition signals. The signals from the olfactory region report the recognition of the smell of an orange after an evaluation of air molecules by the odor receptors. Recognition of trillions of such stored relationships enable each one of numerous regions of the brain to perform its unique function. Consciousness results from the assembly of many similar patterns of signals, which reach the regions around the claustrum. At the highest level, these combined signals report a multi-track, multi-dimensioned view of the world. The relationship between conscious awareness and neural processes has been timed by science with a high degree of precision. Benjamin Libet studied subjects who voluntarily pressed a button, while noting the position of a dot on a computer screen, which shifted its position every 43 milliseconds. The noted moment of depressing the button was the moment of conscious decision - the exact instant the subject thought he made the decision to press the button. The image of the location of the dot on the screen was a sensory message, which was stored and could be recalled by the subject as the decision moment. Libet had also separately timed the beginning of motor neuron activity in the brains of his subjects. He discovered that the brain had begun to act 350 milliseconds before the subject thought he had made his decision. The brain made the decision and motor systems prepared to act. It took 350 milliseconds for awareness of the action to be processed to reach the regions linked to the claustrum. The region was the consciousness dashboard, which reported the event, after those drives had already been set in motion. Evidently this region did not make the decision. 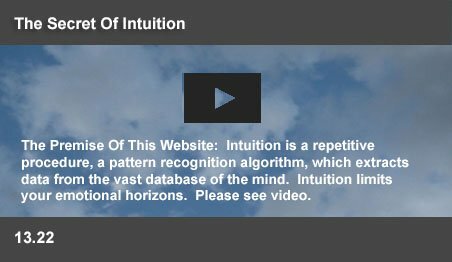 This website suggests that intelligence is an algorthmic process. Typically, the combinatorial memories in the olfactory regions store a vast inherited and acquired knowledge of smells. The smell signal patterns from this region are symbols representing combinations. Similar symbols enable all the functional networks in the system to learn, remember, recognize, and communicate. 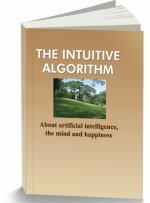 Intuition is an elimination algorithm, which enables these functional units to coordinate responses, making decisions within milliseconds. Science has confirmed the existence of such autonomous regions by studying the "homeostasis" of animals in the survival process. Through live experiments, science reported the effects on animals of progressively destroying higher level regions. These regons were substantially autonomous and performed diverse functions. They were self regulating, independent and cooperative. The lower level regions were able to maintain a steady state in a changeable environment, even when severed from the whole. In spite of being isolated from the top, the regions below maintained their own constant states within the body, using various sensing, feedback and control systems. As higher levels were included with the spinal cord below the cut off section, more effective controls were retained. In this hierarchy, each region demanded only critical inputs from higher levels. Scientists likened the process to a federal government. At the lowest levels, people managed their affairs by themselves. Higher level decisions were made by the communities, by the state governments and finally, by the central government. Consciousness is the abbreviated report to the central government's of the activities of the system. The claustrum is linked to the sensory, recognition, motor and emotional regions of the brain. Objects or events in the real world have many attributes, including color, shape, distance, velocity, smell, sound and feel. A PET study by Hadjikhani revealed the involvement of the claustrum in cross-model matching, in tasks that require the simultaneous evaluation of information from more than one sensory domain. Without this structure, the subject may still be able to respond to simple, isolated or to highly familiar stimuli, but not to complex or unfamiliar ones. The claustrum appears to enable the conscious experience, where these objects and events are perceived in an integrated manner and not as isolated attributes. Researchers led by Mohamad Koubeissi at the George Washington University were using deep brain electrodes to record signals to identify the originating regions of epileptic seizures for a patient. When they applied high frequency electrical impulses to the claustrum for the patient, the subject lost consciousness. She stopped reading and stared blankly into space. She failed to respond to auditory or visual commands and her breathing slowed. As soon as the stimulation stopped, she immediately regained consciousness with no memory of the event. The patient lost consciousness every time the area was stimulated during two days of experiments. The impulses affected the woman's consciousness rather than just her ability to speak or move. She gradually spoke more quietly or moved less and less until she drifted into unconsciousness. Since there was no sign of epileptic brain activity during or after the stimulation, the team is sure that it wasn't a side effect of a seizure. The stimulation appeared to switch off consciousness. Intuition enables nerve cells to identify patterns by eliminating (inhibiting) unrecognized patterns. It causes the motor system to choose a particular path for the hand to move a piece on a chess board, by canceling out alternate paths. The nervous system has innumerable regions, which make independent decisions intuitively. At the “dashboard” level, the claustrum may inhibit those patterns, which do not appear to fit, to create a rationalized whole. The claustrum may inhibit conflicting viewpoints, which do not match the final decisions of the system. Millions of decisions have been taken before reaching the claustrum level to produce a final assembly of compatible possibilities to create an integrated whole. Consciousness does not make the decisions of the mind. Thousands of independent regions make cooperative decisions, where intuition continually inhibits incompatible patterns. Consciousness has no awareness of innumerable factors, which caused the decision to be made. A conscious search may yield a reason, but it may not be the true reason. A conscious decision merely implies our understanding of the broad background of that decision. Does consciousness exist outside the physical world? While the claustrum appears to be the neural correlate of consciousness, nothing in the physical world can explain your subjective experience of the three dimensional world of color, sound and sensations. While billions of nerve cells fire to enable you to subconsciously recognize the ideas in this page, or manage your heartbeat and breathing, the claustrum is the entity, consisting of a small fraction of the multi-billion cell network, which sees the words on this page - conscious awareness. In the theory of complex systems, emergence is the effect, where new patterns arise out of myriad simple interactions. New properties do emerge at higher levels of complexity. Psychology emerges from biology and biology from chemistry. The whole completely differs from the sum of its parts. Could consciousness emerge into a non physical knowledge dimension as the complexity of a neural network increases? But even if consciousness is nonphysical, Libet's experiments suggest that it still does not control the system. Consciousness shifts powerlessly between its own conflicting perspectives. This page was last updated on 17-Sep-2016.